This is Amber the chicken. 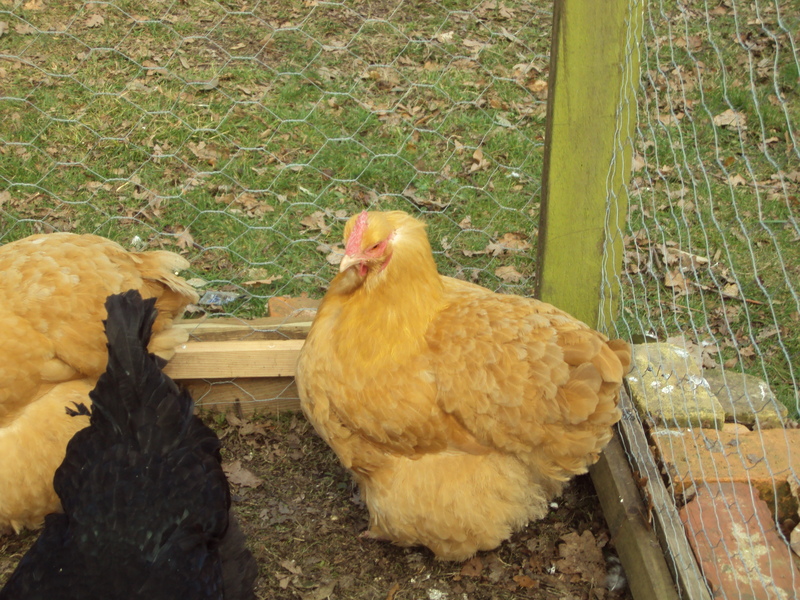 She is orange (obviously), fat and at times unbelievably stupid – I know I should be hugely insulted but hey, how many of you out there have a chicken named after you, orange, fat, stupid or otherwise? She (or her sister Clarissa) managed to squish the new born chicks that the ACL was trying to nurture not once but twice and so to that end the ACL, or rather her husband Harley Man, has purchased an egg incubator to see whether they’ll have more success…watch this space for cute fluffy chicks, fingers crossed. The Spring bulbs pushing their way through the soil and becoming a splash of much needed colour in a still very bare garden – the snowdrops, hellebores, daffodils and then later bluebells carpeting the copse at the bottom of the garden. The primroses that I have unearthed from their Winter slumbers buried beneath the debris of the Autumn and which are now yellow and pretty. The million birds that live in my garden and seem to get up at 4 in the morning busily nesting – since the demise of the cat they are around in abundance unlike last year when they abandoned me in the face of a prowling and very naughty ginger nutter. They swoop and flutter all day singing as though their very lives depend on it and it’s a joy to listen to. Blue skies and enough warmth in the sunshine to make you feel that Spring might just have arrived. Friends are digging gardens, planting seeds and making vegetable growing plans and it feels like the very long and cold Winter that we had might finally be over and we are coming out of hibernation. And randomly and therefore in no particular order, newly cut and neat hedges, bright polyanthus in the shops, bunches of daffodils and tulips, 4 days off (ish) at Easter to look forward to, lighter evenings, the clocks going forwards, putting my Winter coat away, planting the vast quantity of seeds that I seem to have acquired, feeling the need to lose some of the Winter blubber (I succumbed to a chocolate brioche this morning…) in order to look lithe and lovely marginally thinner by Summer because those layers of clothing will all too soon be gone, getting some colour in my pale Winter cheeks, apple blossom and seeing Mrs Wren teach her babies to fly (she lined them all up on the pergola and pushed them off one by one last year). I feel more positive as Spring is here and there is the promise of Summer in the offing. I feel energised and enthusiastic. Long may it last!